There are many things in this world that are older than you might think. For example, the Pope’s title of “Pontiff” predates Christianity by almost a millennium. The mouse driven computer with a mouse, hypertext links and videoconferencing dates back to 1968. But while some things are older than you think, other things are newer, like ranch dressing and Post-It Notes. Try this experiment. Go to a restaurant and order a salad with ranch dressing. Odds are, you’ll get exactly what you ordered. Today ranch dressing is ubiquitous, from the corner McDonald’s to the upscale steakhouse. In fact, it’s been the most popular salad dressing in America for over 20 years. But Ranch Dressing, as we know it, had only been around since 1983. That was the year it was first bottled and sold as a premade dressing. Before that, it had to be mixed up with mayonnaise and buttermilk. And even that recipe only dates back to 1954. 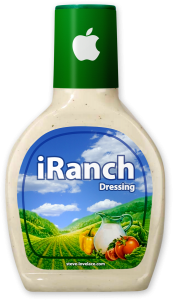 Considering how common ranch dressing is, it’s hard to think that its only been around for a generation or two. It’s hard to imagine a modern office without the yellow Post-It Note, but these little sticky notes have only been around since 1980. Post-It Notes started with a 3M scientist trying to invent a super strong glue. Instead he ended up with a super weak one. Instead of throwing it out, 3M employees put it on the back of some yellow scrap paper. Soon the Post-It Note was born, coming onto the mass market in 1980. It’s interesting that Post-It Notes entered the work world right around the same time as computers. Considering how many people use them to write down passwords, this can’t be a coincidence. Ranch dressing isn’t the only popular food item invented in the last 30 years or so. Believe it or not, Tiramisu was invented in the early 1980s. Probably. No one’s sure who first invented it, but it first started to appear in 1982, right around the same time as ranch dressing. And while it’s not as omnipresent as ranch, it’s still a common dessert in just about any sit-down restaurant. This one is much older than the other four items on this list, but it’s still a lot newer than you might think. Our alphabet started with ancient Phoenicians over 3,000 years ago, but the letter J only dates back to the 17th century. Before that, it was just a sloppy letter I. And even after J acquired a sound of its own, it wasn’t always included as a full-fledged letter of the alphabet. When Pierre L’Enfant created the city of Washington in the late 1700s, he named the east-west streets after letters of the alphabet. But he didn’t include J, since J was just a consonantal version of the letter I. As a full-fledged letter of the alphabet, J is only 200 years old, a baby compared to the 3,000 year old letter I from which it’s derived. Are there other modern things that are much newer than expected? If you can think of something, let me know in the comment section.